Their 2007 release 'Hell Destroyer' was a real punch in the stomach. To stay in shape, I run about 8 miles once a week. When doing that I take my MP3-player with me. One of the albums I listen to while running is 'Hell Destroyer'. I must have listened to it over 100 times, but I still like it. There are not that many albums I still like to listen after listening to it so often. Can Cage come with an even better album? Yes, they can! Since I got the download from their record company I at least listened to it once a day. At first I thought that it was a little superior than 'Hell Destroyer', but after listening to it 20 times, I am sure it is even better! 'The Science of Annihilation' has the same ingredients as their fourth album, but it is even more powerful and on occasion faster. Sean Peck is in top form, he switched from aggressive to high pitched King Diamond-like vocals ("Black River Falls") without any problem. Every song is finished and a hammer. Even the biggest bands in the world have one bad song on their album, but Cage hasn't. The production is outstanding, the riffs are amazing, the drums of Norm Leggio are superb and sometimes so fast as if the devil himself is chasing him. 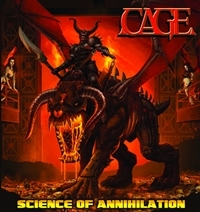 Cage has again set new standards in the heavy powermetal genre. I don't think there will be any powermetal band which can top this one this year. Take for example the fastest song on the album "Speed Kills", I haven't heard such a splendid track since Flotsam and Jetsam's debut 'Doomsday for the Deceiver'. That album must be the main influence for this track, perhaps they have even stolen a bit from it. I could write on and on and on and on and on and on and on and on and on and on and on and on and on and on and ... (I think you get the message) about this amazing album, but I will stop now. There is only one thing I want to point out, CAGE RULES!!! THEY ARE THE GOD'S OF POWER! !